Israel – history, current events, photos, historical sites, living, etc. A selection of Jewish Children’s Books is in a separate section of the Library within the classroom/school office. Borrowing books is simple. There is a 3 x 5 purple index book and pen either on the library table or on a center shelf. On a separate card list your name, phone number and/or email, and the date you took the book. Be sure to list the title of the book and author also. You are welcome to keep the book for 3 weeks and can renew it for an additional 3 weeks with a phone call or email. Return the book to the library table in the library. The Library is open any time the Synagogue is open. It is a self-serve Library. However, the Librarian is willing to work with you to find books on special topics. Please call or email 242lorraine@gmail.com. 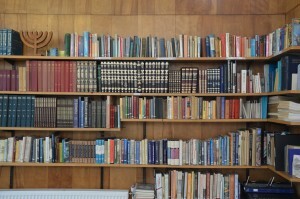 Book donations of Jewish content and in good condition may be donated with approval of the librarian. All donations become the property of the Congregation. If you wish to donate books to the Library or for the sale book cart – “Books for Bucks” you need to leave a note with the date, your name, and your phone number. These books, too, should be in good condition. Paperback books will sell for $.50 each and hardbacks will sell for $1.00 each. There will be a container on the cart in which you can leave money or a check. All proceeds will be donated to the Sha’are Shalom general fund. Donated sale books will be discarded or donated elsewhere if they do not sell within a reasonable time. Machine Embroidered Bookmarks are available for a donation of $3.00 to $7.00 depending on size. Bookmarks can be made to order by contacting me. If you have questions or comments please contact me at 242lorraine@gmail.com or by phone at 772-359-7370.